READ! Kaylee's guide to a successful starter skyblock! Discussion in 'Guides & "How To"' started by Kaylee, Sep 22, 2012. Are you a noob at skyblock? Don't know what to do? Well here are some helpful tips to get you started! 1.) One of the most important things you'll need is the all-mighty cobblestone generator. 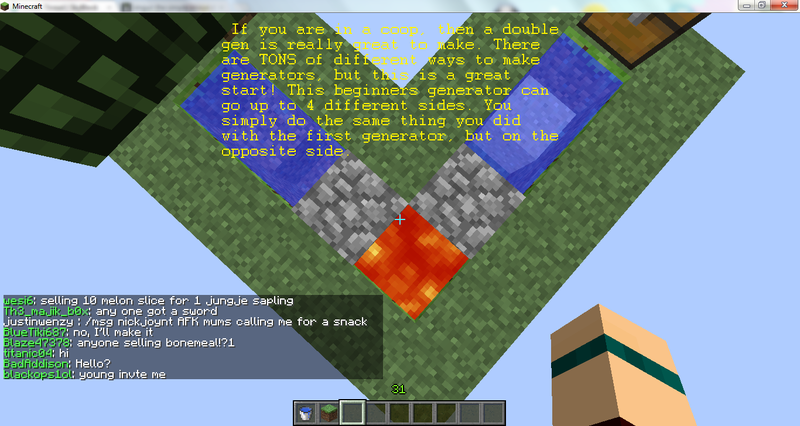 So, to make your first cobble generator, you want to make something like this. 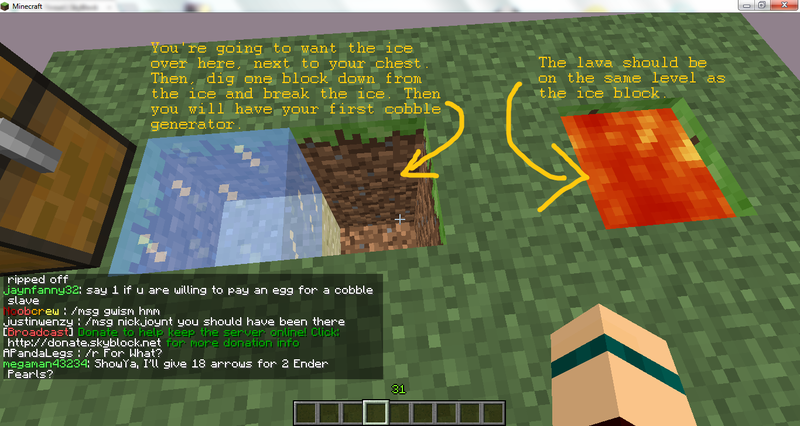 *NOTE* The lava is on top of the bedrock in this form, so you want to cover the lava with something! A cobblestone slab would work fine. Why put this in such a formation? Great question! I'll show you. I like this, its helpful for new players. If a way to get them to here were easy, like in game links. You might even think about a youtube video? You can make a skyblock channel, and have a series of beginner tutorials. It would also be good for publicity and make you a rock star . Okay, saplings. This is going to be pretty easy since there isn't much to it. 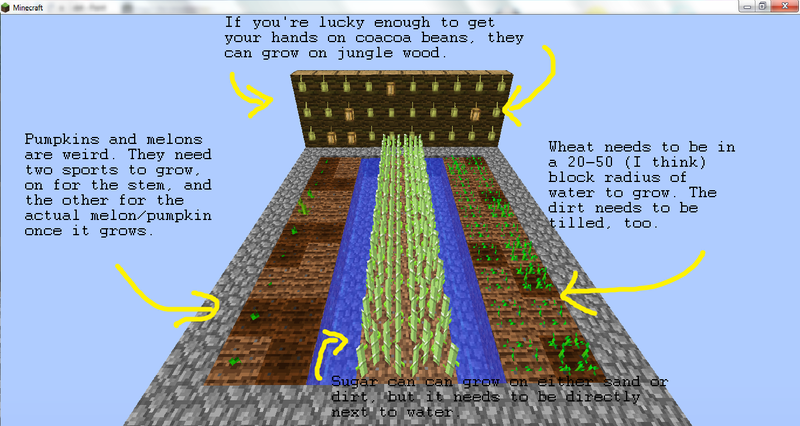 If you want to get different saplings, I do believe the villagers at spawn will trade with you for them. If not, other players will. Trees not growing? Try bone meal. If they still aren't, let a mod know. Noobcrew love's to decorate. 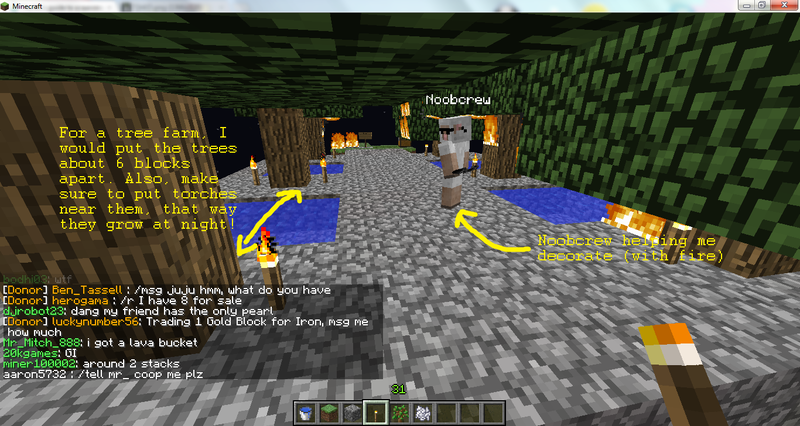 He wanted to decorate my wool mansion with fire too. Maybe I will do that after I do the tutorial here. yesss and do a voice over because people don't like to read lots of text if u know what i mean. 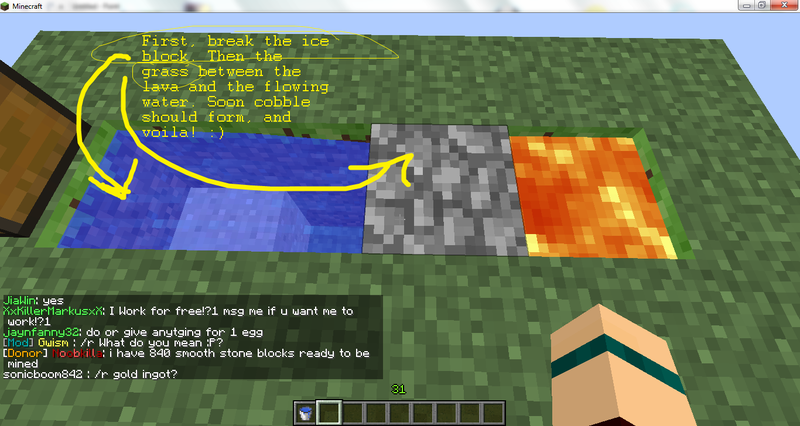 Its easier to follow in voice annotation. Sugar cane grows faster when placed on sand. ok I tried doing the whole voice over thing and it sucked, so until I get a head set, it will be pics. Sorry! The water just makes the tilled dirt hydrated, this is not necessary for wheat, but it makes the wheat grow faster. Also, if there isn't any wheat being grown on it, it will revert to dirt. A minor point... all dirt within 4 blocks of static water horizontally (at the same level) will be hydrated. The most efficient is one block of water in the center of a 9x9 plot of dirt. If dirt is hydrated but no crop is on it, it will stay hydrated. You can walk on wheat, but cannot jump on it or flood it (in those cases, wheat will harvest and seeds will drop). When I said revert to dirt, I meant that if it isn't near water. Just so y'all know, you can make your own of these! If you want to make your own tutorials on stuff that'd be great. Please post them here, though!! I have only 1 request. I want this forum to have only LEGIT skyblock tutorials. Not anything to do with donor items. But Kaylee you have coacoa beans up there wahhhh!!! Maybe you can audition/vet any of your work and submissions of others here in this thread, and you start and maintain a new sticky thread (closed to public replies), so its organized, concise, and on topic. It will get picked up by the search engines, when text is typed out, in addition to being in the photo text (search bots don't index text content in photos). Since this is the Skyblock server that sets the standards, then its nice if Skyblock questions (in particular) google highly. Owning the domain name (skyblock.net) and ensuring use of sentences, and use of the word Skyblock would help that thread perform well. Just so y'all know, you can make your own of these! If you want to make your own tutorials on stuff that'd be great. Please post them here, though!! I have only 1 request. I want this forum to have only LEGIT skyblock tutorials. People will certainly post here to ask for help. If we could get noobcrew to put in a tutorials forum that you have to have an approved thread to post there(To prevent players from spamming), I think it could work out quite well. you forgot to add more!